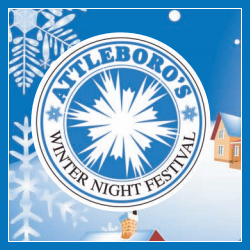 This free family friendly event is outdoors and held in downtown Attleboro. The festival features ice carving, fire jugglers, a grand bonfire, a winter craft fair, a fine jewelry exhibit and sale, live music, warm food, hot chocolate and more! Kids can slide down a 90-foot slide called Snowzilla or bounce in a gingerbread bouncy house. Everything is free except food and drink, but the prices are capped at $5.00 to make the venture an affordable one. Come visit Attleboro for something fun to do on a Saturday night. Plenty of free parking. Rain date is Sunday, Feb. 24th.